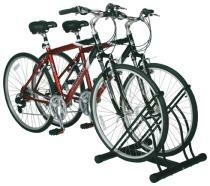 Bike storage is a real problem for many homeowners, but it does not have to be that way. Are bikes getting in the way? Leaning them againest a wall or leaving them on the floor a problem? Need extra room in your garage? Racor offers innovation bike stgorage solutions to help create a safe, organized places for the family’s bikes, freeing up more precious garage space. 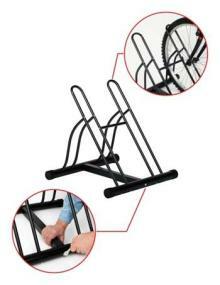 The Racor’s Floor Bike Stand is a quick fix for your bike storage problems. You can safely and securely store two bikes on the floor so they won’t tip over and scratch your car or harm other valuable belongings. The floor bike stand is designed so it can be assembled to hold bikes in the same direction or opposite directions, depending on your space. The floor bike stand is designed to cradle your bikes tires holding the tire in the front, underneath, and on the side to keep it from falling. Resin feet protects your floor and keeps the stand in place. For better stability with smaller wheeled bikes, back rear wheel into the opposite side of stand (into upright tubes). 1 square tube, 2 tubular legs, 2 wheel supports, 4 upright tubes, 1 cross brace, 2 hex head bolts, 2 curved washers, 6 long screws, 8 short screws, 1 adjustable wrench, and 1 allen wrench. Racor has the largest variety of storage solutions to organize and store bikes, sports equipment, tools, lawn and garden supplies, bulky items like ladders and totes, and much more. Our long-lasting, space-saving storage products help gain control of your clutter and help homeowners “Reclaim their Garage”.